In this blind tasting, judges are served samples of each rum in uniform tasting glasses. Each spirit is then judged on four qualities: aroma, initial taste, body and finish, by a panel of between 15 and 30 industry professionals including distillers, mixologists and spirits journalists who have demonstrated their expertise with sugar cane spirits. Each judge awards points for each of these attributes then gives an overall score of 0 to 100 points for each spirit. The scores for all of the spirits in each category are divided by the highest score. Gold, Silver and Bronze Medals are awarded according to the natural grouping of the results. While there are other respected tasting competitions in the US and Europe, this is a unique opportunity for Sugar Cane Spirits to be judged on their own merit by people who know sugar cane spirits and share their passion with the industy. Judges include industry professionals including writers, consultants, distillers, importers and distributors. Here is a partial list of confirmed judges for this competition. Warren Bobrow - Morristown, New Jersey - Warren's writing has appeared in Saveur, Edible Jersey, Chutzpah Magazine, Served Raw and is the Editor of the Wild River Review where he writes the Wild Table Column. He whetted his appetite for rum, rhum and ron aboard his family's yacht in the Caribbean. Chris Braun - California - During the 20 years Chris spent living and working in France he developed an appreciation for fine libations. He has judged the Los Angeles Wine and Spirits Competition the last three years and works as a wine and spirits broker. Martin Cate - San Francisco, California - Creator of Smuggler's Cove in San Francisco, CA, Martin is one of the leading figures in the modern Tiki bar scene. He is presently consulting for rum oriented bars and restaurants across the US. 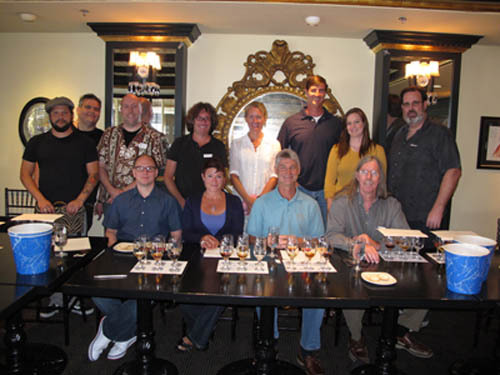 Forrest Cokely - Costa Mesa, California - Forrest is a member of the Ministry of Rum Connoisseur's Cabinet, blogs at A drink with Forrest and is employed at Hi Time Wine Cellars where he writes the spirits pages of their monthly newsletter. He is also an accomplished cocktail designer. Shirley Copeland - San Francisco, California - co-founder and managing editor of Served Raw, an online magazine focused on off-the-radar food and drink experiences. Shirley is passionate about crafting original cocktail recipes and hunting down new, rare spirit discoveries. John Gibbons - Milwaukee, Wisconsin - John Gibbons is an independent spirit ambassador, cocktail enthusiast, and rum collector. He has worked with Bryant's Cocktail Lounge, Bittercube and Great Lakes Distillery. His rum collection has grown to nearly 100 unique rums from all over the world. Jacqueline Gréaux - San Quentin, California - Founder of the St Barts Spirits Company and importer of Batiste Rhum Agricole. Growing up on French St Barts, Jacquie grew up around fine food and drink and inherited a passion for rum from her grandfather. Frank Jakubka - Livermore, California - For more than 20 years Frank has studied and crafted his knowledge of wine and spirits in the winemaking, hospitality, and sales industry. He enjoys teaching, judging and creating food, wine and spirits and holds the prestigious CSW and WSET A/C certifications. Jordan Mackay - San Francisco, California - Jordan has written about wines and spirits for a number of magazines including the New York Times, 7 x 7 and a host of other media. Dave Russell - California - sailor and co-founder of RnD Rum Reviews. Dominic Venegas - San Francisco, California - Dominic is a consultant to the beverage industry who honed his knowledge at the illustrious John Walker and Co retail spirits store. In order to limit palate fatigue the tasting competition is divided into four sessions with one break during each session. During the breaks the judges are encouraged to discuss anything other than the spirits they are tasting during that session. At least 20 judges at each tasting session ensures that no one or two judges can influence the results and that each spirit is judged on its own merit. None of the judges are compensated for their travel or accommodation expenses during the competition. There are no corporate sponsors for this competition. Edward Hamilton and the Ministry of Rum are solely responsible for the competition and the results.